by Christine D. Pohl. Wm. B Eerdmans Publishing Co., 2012. This book offers a theological alternative to leadership books written from a secular perspective. Christine Pohl is Professor of Church in Society at Asbury Theological Seminary, as well as the Associate Provost for Faculty Development. 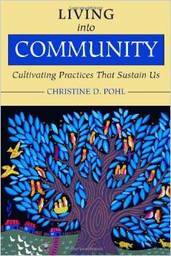 Pohl examines four practices that shape community experience: gratitude, promise-keeping, truth-telling and hospitality. A particular strength to this book is Pohl’s ability to highlight both the virtues and the shadows of these practices. For example, hospitality is an activity that religious communities can and should be skilled at. Yet, there are boundaries to hospitality. Certain activities related to hospitality can become skewed and ultimately unhealthy for a congregation. At the end of the book, there is a helpful section on questions for discussion and reflection. This book is best read in community, perhaps serving as Lenten reading for an adult education class, or a book to be read by the congregational board before a retreat. Any reader will take away a deeper understanding of what weakens and strengthens community in a religious context.